Is it possible to mute a flash game? Can you turn off the sound effects and game music? Absolutely. Every game, every single time. Obviously you can turn down your speakers or your computer system's sound. If you don't want to hear anything, just turn off your speakers. But what if you want to listen to Pandora or Spotify in your browser, or watch a streaming movie, while playing one of the hundreds of free online flash games on this site (or other flash game websites) in another window? No problem. You can mute the flash game while leaving the sound on in the rest of your browser tabs. And this can be done for any flash game. When using Google Chrome, you can mute the browser tab in which the game is running. I'll walk you through each of these methods. Once you know these tricks, you'll be able to turn off the sound in any flash game from now on. Check to see if the game you are playing has a mute feature built in. Turn off the game sound directly, using that option. Games that include an Options screen usually provide a link to it from the game's main menu. For example, the free Classic Pinball online game here on Memory-Improvement-Tips.com includes a Sound On/Off selection in the Options window. To access this option, you would first click the Options button on the Main Menu screen. This opens the Options screen. 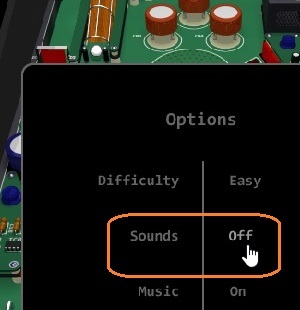 There, you could click the Sound: On/Off option to turn off the game sounds. Some flash games have multiple options for muting sound. For instance, the classic pinball game has a separate Music: On/Off option for disabling the game music. To mute all sounds in the flash pinball game, you would turn off both the Music and Sound options. But what if the game doesn't have a Mute option, or you can't find it? No worries, you can use methods 2 or 3 to mute the game. 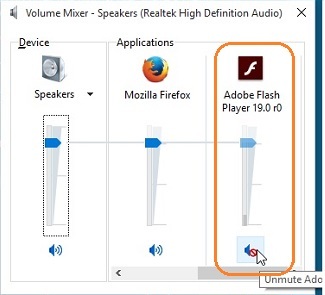 You may be able to mute the flash game through your computer's Volume Mixer. The mixer is usually accessible by right-clicking the speaker icon in the system tray of your computer. Flash games run in your browser on a free piece of software called the Adobe Flash Player. The flash player comes pre-installed in many browsers. You might not even realize you have the player. If flash games work in your browser, you do have the player installed. The flash player is running in the background when you play a flash game. Start the flash game. Then right-click your computer's speaker icon, and select the option related to your speaker's volume mixer. On my computer, the right-click option is Open Volume Mixer. (Yours might have a slightly different name.) Selecting this opens the Volume Mixer window. In the Volume Mixer window, click the speaker icon at the bottom of the Adobe Flash Player to mute it. This should turn off the sound in the flash game without muting the sound in your other browser tabs or windows. Note: If you are running multiple flash programs, muting the flash player may turn off the sound all those programs as well. If all else fails, open the game in the Google Chrome browser. 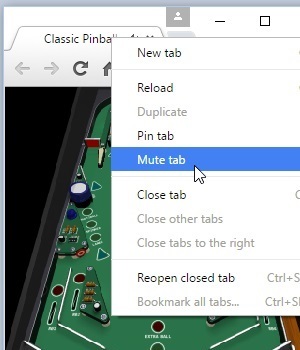 Chrome has an option that allows you to mute individual browser tabs. By opening the flash game in Chrome, you can mute the browser tab in which the game is loaded. Note: If the game opens in a pop-up window, change the pop-up window into a tabbed window. Then you can mute the tab. To change a pop-up into a tabbed window in Chrome, right-click the title bar of the pop-up window. Click the "Show as Tab" option to re-display the game in its own tabbed window. To mute the tab, simply right-click the tab and choose "Mute tab". That's it! What you'll have is the flash game running in one tab, with the sound off, while the rest of your browser tabs and windows have sound turned on as normal. Listen to your own music or watch videos in the other windows while playing the flash game in its own muted tabbed window. There you have it. Three ways to mute a flash game. Note the third method, the "Mute tab" option in Chrome, should always work regardless of game or computer system. If you've got any constructive tips or feedback about this article, feel free to leave your thoughts in the Comments section below or send me a message through my Contact Me page.